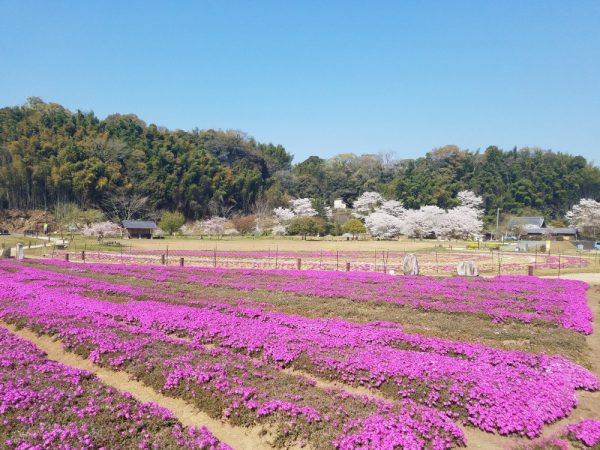 Usuki Stone Buddhas Village Festival on May 3-5, 2019　Usuki Stone Buddhas host a festival featuring local food, souvenirs, and hands-on programs. 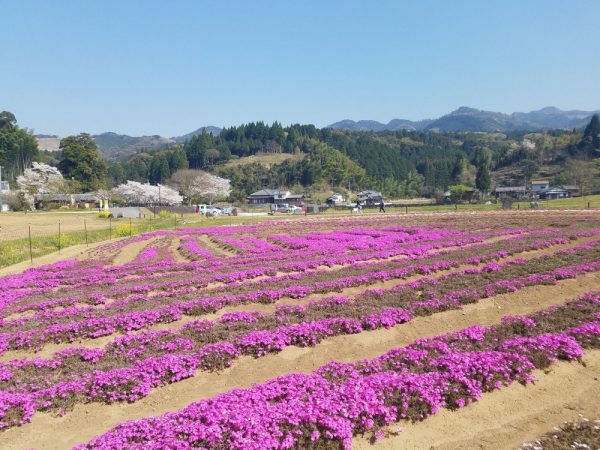 Check out National Treasure Usuki Stone Buddhas and the fun activities below in just peaceful and calming atmosphere of the village. 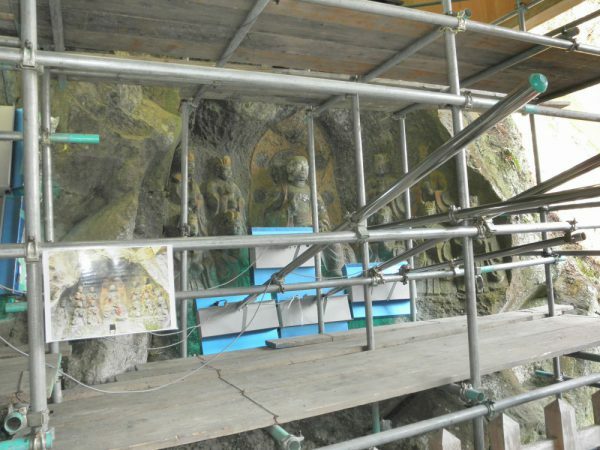 Date Fri, May 3, 2019 – Sun, May 5, 2019 Location Usuki Stone Buddhas Address 804-1 Fukata, Usuki-shi, Oita Access Please refer to the site (https://sekibutsu.com/english) Highlights -Special Exhibition film archives of the Stone Buddhas at 9:00-16:00 in the Furuzono Cluster – Free soft-serve ice cream coupon for the first 200 arrivals with purchase of entry ticket (for each day). The coupon can be used for the shops in the Usuki downtown. 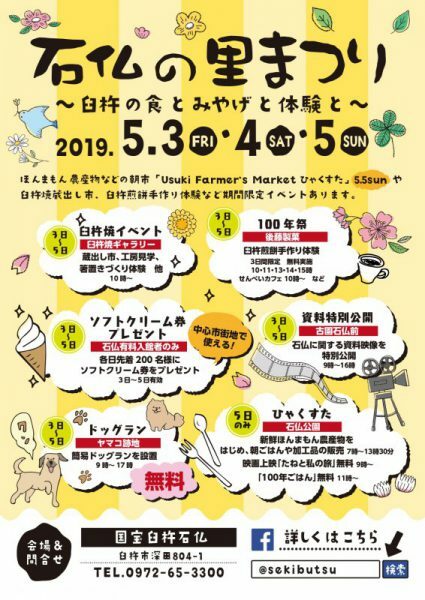 -Usukiyaki (pottery): warehouse sale, studio tour, hands-on program of making chopstick rest, starting from 10:00, in Gallery Sarayama (785 Fukata, Usuki-shi, Oita*) -100th anniversary of Goto Seika: free hands-on program of making Usuki-Senbei (biscuit) at 10:00, 11:00, 13:00, 14:00, 15:00, and cafe opening from 10:00, in Goto Seika (118 Fukata, Usuki-shi, Oita*) -Temporary dog park next to Goto Seika at 9:00-17:00 – Usuki Farmer’s Market at 7:00-13:30 on May 5, 2019 *Note: Gallery Sarayama and Goto Seika are located in 1-minute walking distance from Usuki Stone Buddhas. 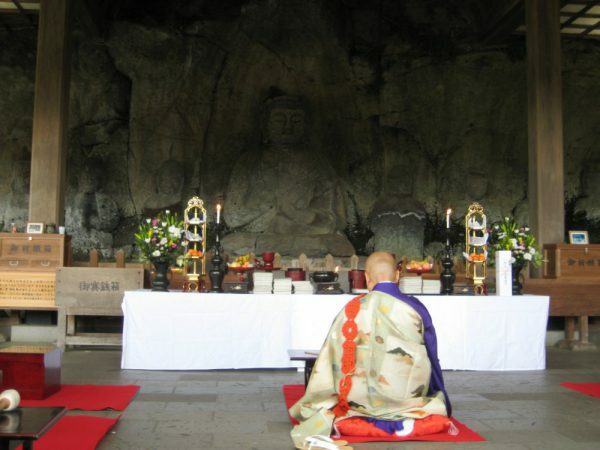 Buddhist Ceremony is conducted once per year to renew deep gratitude for the Stone Buddhas and ancestors who devoted themselves to creation of the Stone Buddhas. They are believed to have been carved around 1,000 years ago between the late Heian period to the Kamakura period. 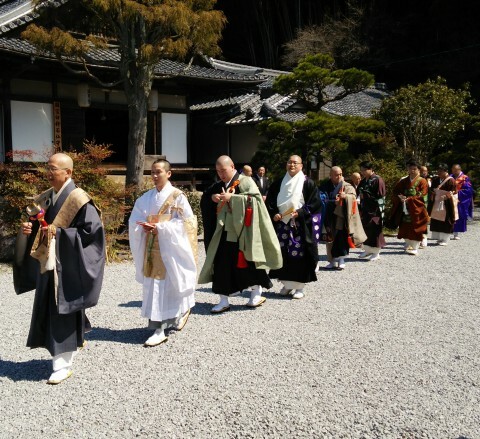 The ceremony is led by officiating monks of the Buddhist temples, starting from Mangatsu-ji Temple, via four clusters of the Stone Buddhas, and ending at the statue of Renjo-Hoshi, the legendary creator of the Stone Buddhas. Please visit and feel free to join our event! 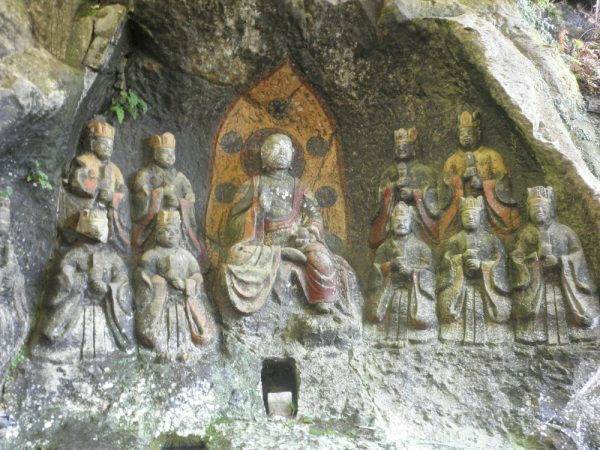 Venue: Usuki Stone Buddha, 804-1 Fukata, Usuki-shi, Oita. Copyright (C) Usuki Sekibutsu. All Rights Reserved.